Westinghouse, hurricane safety, dogs tell time with their noses, Supergirl, "they" as a gender neutral singular noun. On this date in 1846, George Westinghouse was born. An inventor, engineer, and industrialist, he received 361 patents, including the revolutionary railway air brake, which led to the creation of the Westinghouse Air Brake Company. The person most responsible for the United States' adoption of alternating current for electric power transmission, his Westinghouse Electric & Manufacturing Company purchased European patents for AC current transmission, and later Nikola Tesla's AC motor patents. Westinghouse hired Tesla to continue to improve the design of AC systems, and in 1893 the company beat out Thomas Edison's direct current company, General Electric, to win the contract to provide electric lighting to the World’s Columbian Exposition at Chicago. In 1895, Westinghouse was hired to build the first large- scale, alternating current electric generating plant in the world, the Adams Power Plant, at Niagara Falls. 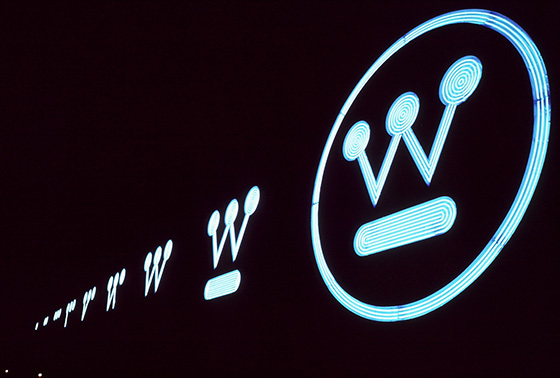 The original Westinghouse generators remained in operation until the plant closed in 1961. A financial panic in 1907 caused his resignation from his company, and by 1911 he was no longer active in business. He died on March 12, 1914, in New York City. Westinghouse had located his businesses in the Pittsburgh suburbs of Wilmerding, Swissvale and Turtle Creek. The George Westinghouse Memorial Bridge, dedicated on September 10, 1932, is 1,598 feet long and stands 240 feet above the Turtle Creek Valley. At the time, it was the world's longest concrete arch span structure. George Westinghouse changed the face of the world with his inventions, patents, business sense, and personality. Today is also National Noodle Day. Have at it. A Florida newspaper warns residents of the ten incredibly dumb things you shouldn't do during a hurricane, including "don't rob local businesses and then try to hide in a vat of cooking grease." Which you probably shouldn't do even if you're not in a hurricane. Some people born on October 6 who said some interesting things: George Horace Lorimer, Shana Alexander, Thor Heyerdahl, and David Brin. Oh, and Bruno Sammartino is 81 today. Conservative Glenn Beck's once high-riding The Blaze is is circling the drain. "We had everything when we started in 2010- a huge platform and following- but management screwed it up with their incompetence," one source... "They made so many stupid mistakes, and Glenn trusts the wrong people, who then go and hire other bad people." Science illiterate leaders endanger us all says Bill Nye the Science Guy. Season two of Supergirl premiers on its new home at the CW Network on October 10. This season features visits from Kara's cousin, Superman, and a sneak peak offered by the network shows some pretty stunning, motion-picture quality visual effects. Let's hope the stories are as good. Good grammar conveys a great deal about a person. Indeed. Which makes the naming of "they" as a gender neutral singular pronoun and 2015 word of the year distressing. Humans can only live so long, and we're nearing the limit That's about 11 more presidential election cycles for me, which is more than sufficient.